The Berlin Wall may have been erected in 1961, but the figurative foundation was laid in 1945, as the Soviet Union’s Communist Party and its allies made selections of their areas of influence. 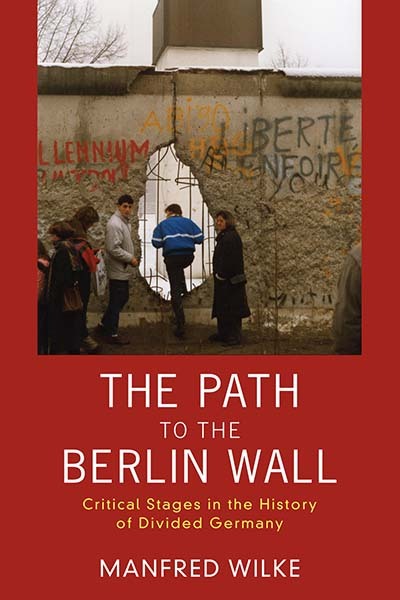 In The Path to the Berlin Wall: Critical Stages in the History of Divided Germany, to be published this month, author Manfred Wilke traces the events that led to the eventual construction of the Berliner Mauer. Wilke’s original volume was translated from German into English by Sophie Perl. Following is Perl’s interview with the author about his upcoming book. Sophie Perl: Professor Wilke, you were 20 years old when the Berlin Wall was built. How did you experience this event? How did your perception change over the following years? Manfred Wilke: I heard about barbed wire going up through Berlin on West German radio that Sunday, 13 August 1961. I can still remember the triumphant voice of an East German reporter celebrating it as a socialist victory – the GDR and Warsaw Pact had foiled the plans of West German and American “warmongers” and thereby rescued world peace. At that point the Wall looked nothing like a declaration of bankruptcy by the SED dictatorship, an expression of weakness rather than strength. I felt that Germany was divided for good. It was very painful, something I could not accept although I had no power to change it. Construction of the Berlin wall with concrete blocks. A crane surrounded in barbed wire stands in the foreground. Berlin, August 1961. In 1963 I faced the Wall for the first time at the Brandenburg Gate. I moved with my family to West Berlin in 1976 and could visit East Berlin with a permit until 1978. It was not until I lived in West Berlin that I truly understood the significance of West Germany’s alliance to the United States for the security and freedom of that city – the Wall helped crystallize this political reality. I was banned from East Germany in 1978 after publishing a book by Robert Havemann – blacklisted in the GDR – in West Germany. Havemann predicted the inevitable downfall of the SED regime, which had already lost legitimacy in the eyes of the people. West German media and politics thought he was out of his mind, that his predictions were just wishful products of his isolation. In 1989 I experienced the fall of the Wall directly: on the night of 9 November, my wife Karin and I entered East Berlin despite our ban. The demonstrations at the border crossings forced the Wall down for all Berliners. We experienced that night as a turning point in international history, the beginning of a new era. In one respect, my perception remained constant over the Wall’s 28-year span: I believed the structure – along with the national division that it embodied – could not be accepted as a permanent reality. Parade of combat groups on the 25th anniversary of the Berlin Wall’s construction. SP: 2014 marks the 25th anniversary of the Wall’s fall. Why is it important to study the decisions that led to its construction? MW: The Ukrainian crisis and the renewal of imperial Russian policy coincide with the book’s English publication. The European Union and United States have reacted to Russia’s treatment of Ukraine with reiterations of our continued need for close economic, political, and military cooperation in NATO to guarantee the security of Europe and the United States. The Soviet blockade of transit routes between West Germany and West Berlin, which caused the Berlin Crisis of 1948 and required the Americans to supply West Berlin by airlift, led to NATO’s founding and a close alliance between West Germany and the United States. That my historical investigation would be so relevant to the current political situation never occurred to me when I published it in German in 2011. SP: What surprised you most over the course of research for this book? MW: Without taking into account the Germany policies of the four Allied powers, it is impossible to understand German history after Hitler. I knew this when I began my research. The GDR was born of Stalin’s Germany policy and represented the cornerstone of the Soviet imperium in Europe. When the people revolted against the SED regime on 17 June 1953, Soviet tanks protected the Party’s totalitarian power. With this in mind, I set out to investigate a controversial question: Where and by whom did the decision occur to erect a fortified border straight through Berlin, separating two halves of the city? Was it [Walter] Ulbricht’s insistence on halting the mass exodus to West Berlin, to which Soviet leader Nikita Khrushchev eventually relented? Or was it Khrushchev himself who ordered the Wall between West and East Berlin? By including Soviet documents in my research, I could trace the interaction between Khrushchev and Ulbricht. As to who gave the final order to seal the border, a contemporary provided clues: General Anatoli Mereshko, officer in the Group of Soviet Forces in Germany (GSFG) in 1961. The GSFG’s top commander ordered Mereshko to mark the precise location of the sector border on a map so that the East German police could erect barbed wire through the city without infringing upon the Allied rights of the Western powers. Mereshko also described Marshal Ivan Konev’s command to the three responsible East German ministers: the operation to secure the border would take place on 13 August at 00:00. Khrushchev had originally pursued different plans during the second Berlin Crisis. He wanted to force the Western Allies into negotiating a treaty that would solidify Germany’s division and transform West Berlin into a “Free City” whose transit routes would be controlled by the GDR. His real goal was to expel the Western troops from Berlin and alter the political balance of power in Europe. This plan failed not least because of resistance from John F. Kennedy at his summit meeting with Khrushchev in Vienna in June 1961. Only then did the Soviet leader consent to closing the border in Berlin. This conclusion confirmed my hypotheses but was not especially surprising; more surprising was the diversity of German–German relations across the border both before and after the Wall’s construction. Germany was nothing like Korea! SP: German readers have a different relationship to the Berlin Wall and the Cold War than American or British readers. Why was it important for you to publish this book in English? MW: English is the international language of politics, culture, and scholarship today, and the construction of the Wall in 1961 was a climax of the Cold War in Europe. The Federal Republic was and still is an important partner in the Western alliance and on the world market. The United States in particular was inseparably connected to West Germany, to protecting West Berlin against Soviet ambitions of eliminating the “island of freedom” in the Soviet sphere of power. After the Peaceful Revolution and the fall of the Wall in 1989, American support was essential to ensuring the reunification of Germany in peace and freedom. Our stories remain intertwined. I am thrilled to share a German perspective on the history of divided Germany, for which the Berlin Wall was and still is the most important symbol.
. Robert Havemann, Ein deutscher Kommunist, ed. Manfred Wilke (Reinbek, 1978). Born in 1941 in Kassel, Germany, Manfred Wilke received his PhD in economic and social sciences from the University of Bremen in 1976 and his post-doctoral degree in sociology from Freie Universität Berlin in 1981. From 1985–2006, he was Professor of Sociology at the Berlin School of Economics, during which he participated in both Enquête Commissions of the German Bundestag on the history of the SED dictatorship. He also served as Research Director of the Research Association on the SED State at Freie Universität Berlin from 1992–2006.